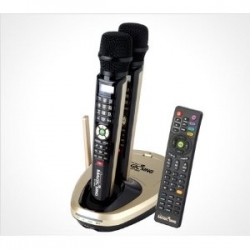 Home | Magic-Sing | Magic-Sing digital karaoke system. Welcome to the new website of Magic Sing Karaoke Belgium. Magic Sing Karaoke is the most simple karaoke system available on the entertainment market , with words like compact , stable , fast , easy to connect and easy to use , this system is suitable for both private home and professional use. With over 100 different songchips in more than 15 different languages ​​you can get an extensive songlist of over 80,000 songs. Since 2004 Stresske BVBA became an authorized distributor for the Magic Sing products . On December 1, 2013 , we signed a formal distribution agreement with the manufacturer of Magic Sing karaoke for the import and distribution of their systems and accessories for the whole European market. This was followed by a license agreement for the development, production and distribution of the "Studio100 Sing-a-long microphone". These two contracts allow Stresske BVBA to become one of the largest importers and distributors of digital karaoke equipment in Europe. Take a look at our brand new website and convince yourself of the quality and capabilities of Magic Sing .